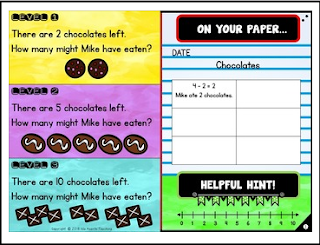 Do you have fast finishers in your class who complete math lessons early and say, "I'm done! Now what?" When they tell you this, are you often in the middle of explaining a math concept to another student? If this is a familiar scene in your classroom, then try out this free sample! OPEN-ENDED MATH FOR EARLY FINISHERS is easy to set-up in your classroom. Rather than printing huge sets of worksheets, all your students will need is one notebook! You just project the file onto an interactive whiteboard/smartboard screen and your class is ready to go! It is paperless, differentiated and allows your students to 'think mathematically', whilst challenging them to solve problems in a variety of ways! And the best part? Your students will soon learn to grab their notebook and start working on the open-ended question of the day without asking you what they need to do next! Bonus! But don't think this product is *only* for early finishers! It can be used for math warm ups, morning work, as part of a lesson and for many other uses! An interactive whiteboard/smartboard is needed to display the questions for the students.